Distinguishing Features: The broad, fleshly leaves at the base give way to a single stem topped with pale yellow flowers in late spring. 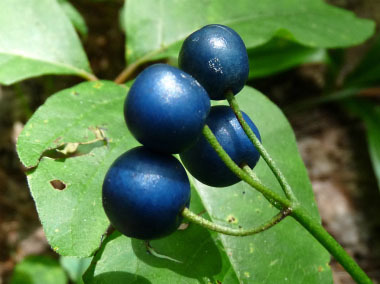 In the summer, those flowers turn into beautiful, yet toxic, bright blue berries. 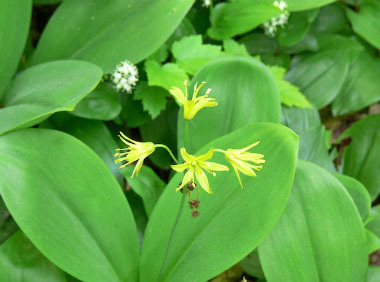 These lilies often grow in dense mats in forests. Flowers: Flowers form in a loose umbel-like terminal cluster of 2 to 8 flowers. They are nodding and the petals and sepals are alike. It is yellow to greenish-yellow, oblong to lanceolate, measuring up to 1.6 cm (.6”) long. Each flower has six stamens which are slightly longer than the petals; Flowers anywhere from May to July depending on location. Each flower bears a poisonous blue berry. 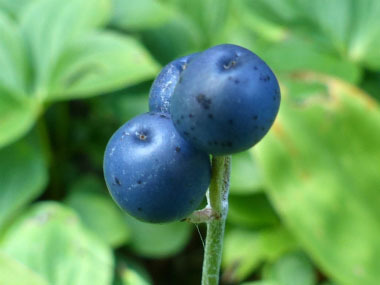 Fields of Nutrition has medicinal benefits and vitamin/mineral content of Bluebead. Leaves: Each plant produces (typically) three leaves that are elliptic to narrowly obovate. 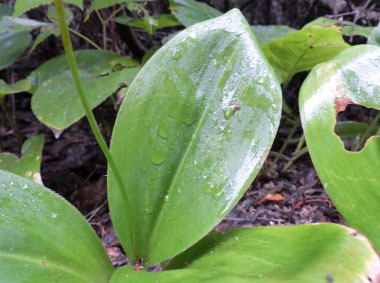 (Although some plants can have 2-5 leaves.) They grow up to 30 cm (12”) long and 10 cm (3.9”) wide. The leaf is light green, glossy and somewhat stiff. Margins are smooth. Height: The stem grows to a height of anywhere between 15 and 40cm (5.9 – 15.7”). 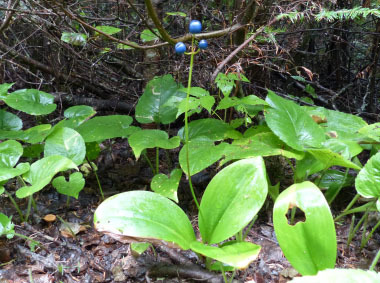 Habitat: Blue bead lilies like the rich soils of coniferous and deciduous forests. 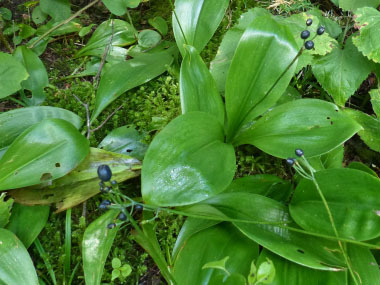 This plant can also be found in bogs, and sometimes in sub-alpine meadows. They grow in cooler temperature maple forests as well. 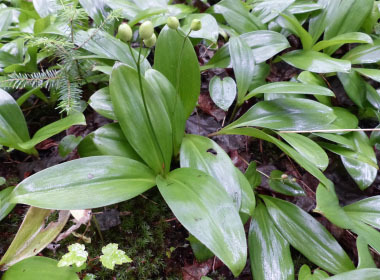 In Canada this plant grows from Manitoba to the east coast. In the U.S. it grows mostly in the northeastern states as well as far south as Georgia and west to Minnesota. 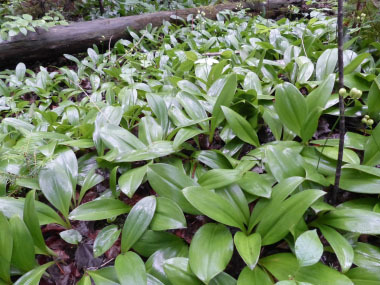 Edible parts: Young leaves are edible raw or cooked. This is best harvested in spring before the leaves unfurl. Older leaves can be used as a potherb. NEVER consume any other part of this plant! Other name: Yellow Bluebead Lily. Special thank you goes out to Macphail Woods for allowing us to use their image of the bluebead yellow flowers.